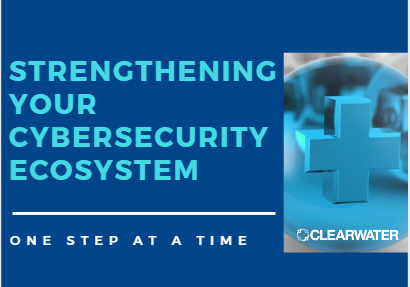 Reflecting back on National Cybersecurity Awareness Month, Clearwater witnessed a widespread expressed need of healthcare delivery organizations to secure medical devices and to understand the full scope of an OCR-quality risk analysis requirements. Below, find valuable updates and resources to help your organization Manage Cyber Risk Right. 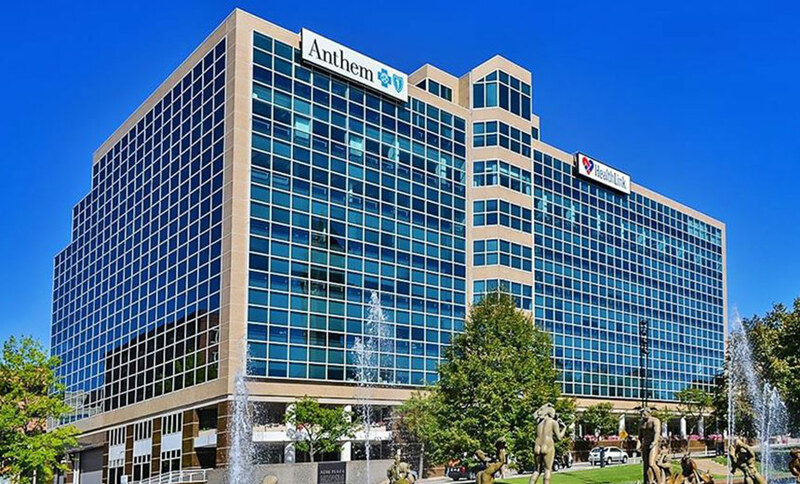 Health insurer Anthem announced in September 2013 that it had been certified as compliant with the HITRUST Common Security Framework. Then it revealed in February 2015 that it had fallen victim to a breach that exposed data on nearly 79 M individuals. And in a report released last week, federal regulators said the cyber attackers likely began their intrusions in February 2014, about five months after the insurer achieved HITRUST certification. 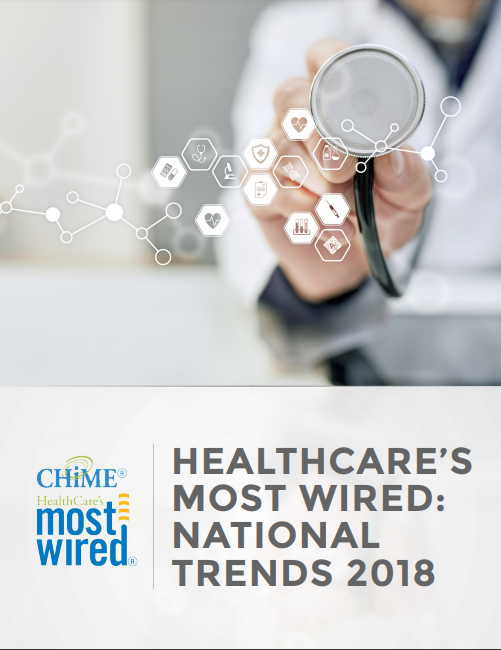 Timely read in light of recent Anthem settlement where a comprehensive enterprise wide security risk assessment wasn't complete: Clearwater's CEO, Steve Cagle shares insights, OCR's focus, & current state of risk analysis from HHS OCR/NIST's Safeguarding HIPAA Summit. Responsibility has been placed upon healthcare providers to secure the myriad of medical devices they procure and utilize. 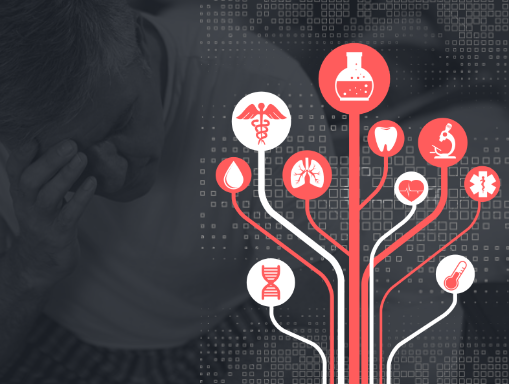 Explore why the security of medical devices is the number one concern keeping many healthcare executives up at night and learn why these devices are so vulnerable to cyber attacks and compromise. As the number and intensity of cyberattacks on healthcare organizations increase, the task of establishing an effective cybersecurity program can seem overwhelming. Explore recommended steps and strategies to strengthen your cybersecurity ecosystem, ranging from simple, low-cost fixes to long-term, strategic improvements. Organizations struggle to fully comprehend the scope of an OCR-Quality Risk Analysis. 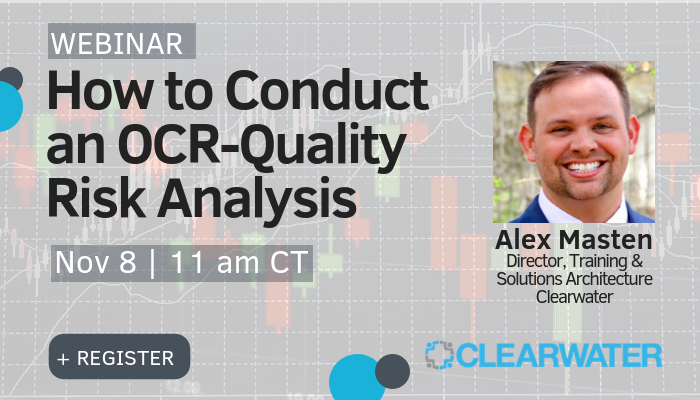 Join us for How to Conduct an OCR-Quality Risk Analysis where Clearwater will share a step-by-step methodology based on OCR and NIST guidance that will help you to understand and act on various risk analysis requirements. 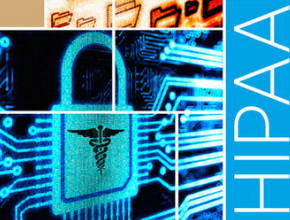 The Office for Civil Rights (OCR) within the Department of Health and Human Services (HHS) vigorously enforces the HIPAA Privacy, Security and Breach Notification rules. 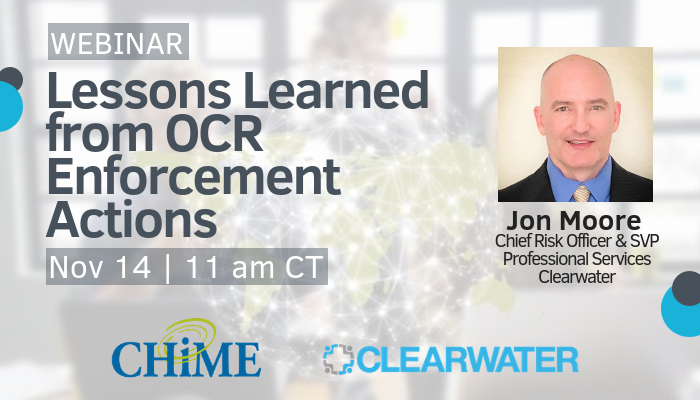 Lessons Learned from OCR Enforcement Actions will cover a select number of enforcement case studies and key lessons for handling an OCR enforcement action or an anticipated action in the event you suffer a reportable breach or are the subject of a complaint. As medical device usage continues to evolve, so does organizational risk and overall patient safety concerns. 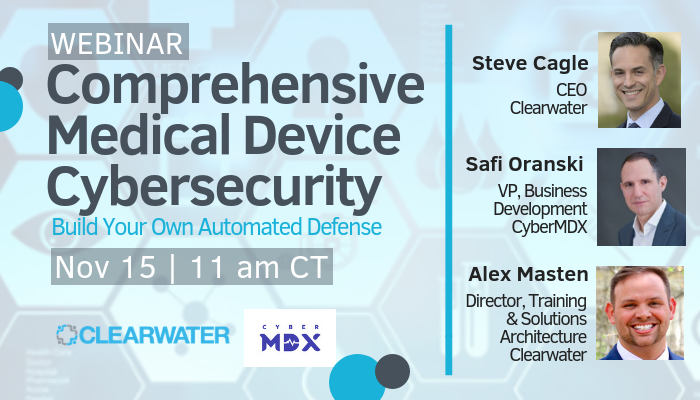 Join Clearwater and Cyber MDX for Comprehensive Medical Device Cybersecurity: Build Your Own Defense to discover how to address evolving medical device risk challenges and improve the security of connected medical devices. Many organizations struggle to bring attention to the issue of cyber risk management – that is, until it’s too late. 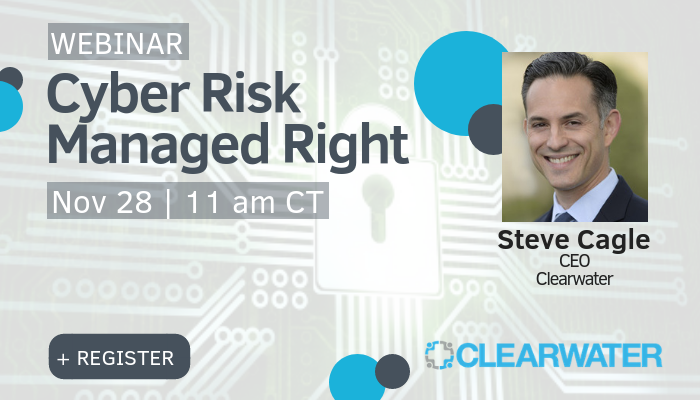 Join us for Cyber Risk Managed Right, a strategic, executive presentation on what you should know about getting your organization on track to manage the ever-changing cyber risk landscape.